Customized ,Graphics Design and Thai Translation by : Assistant Professor Prachid Tinnabutr, prachid@prachid.com, Since 19 May 2005 ,Last Update 16 march 2011. 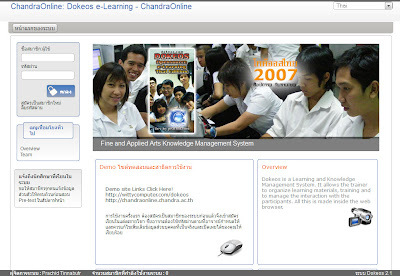 DokeosThai Project :The research and development of educational media innovation supporting the art and design online learning courses by using Dokeos Opensource Learning Management system :Thai Version. by Assistant Professor Prachid Tinnabutr . Division of Fine and Applied Arts. 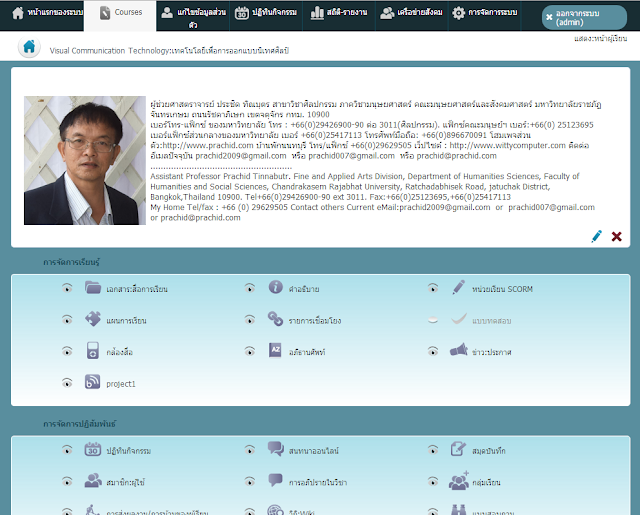 Faculty of Humanities and Social Sciences.Chandrakasem Rajabhat University,Bangkok Thailand 10900,Office URL: http://artnet.chandra.ac.th, http://chandraonline.chandra.ac.th/dokeos Private URL:http://www.prachid.com, email : prachid@prachid.com , Mobile Phone (66)08 9667 0091. Sponsor & Host Vendor Link: www.wittycomputer.com for more information: see languages.txt in the lang folder. Dokeos 2.1 was thoroughly redesigned for mobile devices. Because mobility is not only a change of support, but a change in practices, leading to an intuitive and touchscreen experience. Dokeos e-Learning Thai Edition by DokeosThai Edition is licensed under a Creative Commons Attribution-NonCommercial-ShareAlike 3.0 Unported License. Based on a work at wittycomputer.com. Permissions beyond the scope of this license may be available at http://prachid.com. เว็บไซต์เครือข่ายการจัดการความรู้อย่างพอเพียง สาขาวิชาศิลปกรรม คณะมนุษยศาสตร์และสังคมศาสตร์ มหาวิทยาลัยราชภัฏจันทรเกษม. Awesome Inc. theme. Powered by Blogger.